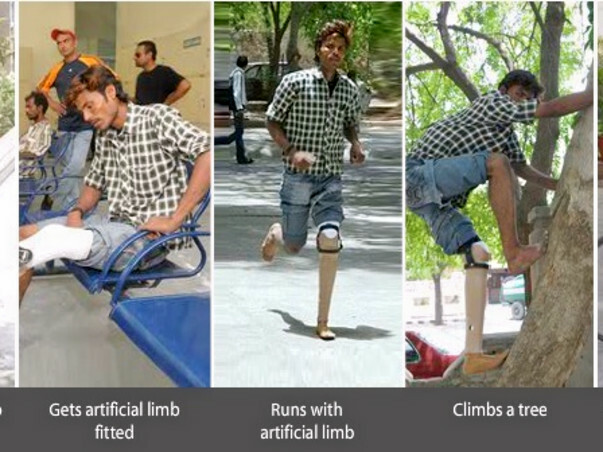 Fundraising to help Jaipur foot provide artificial limbs to 200 amputees. Support my project! Jaipur Foot is the World’s Largest Organization for the Disabled. So far, it has helped over 1.4 million people all over the world by fitting the Jaipur Foot / limb and by providing callipers, and aids and appliances. By providing high-quality durable artificial limbs, the organization has helped restore not only mobility but also dignity to the disabled. This artificial limb has been named one of the 50 best inventions in the world by Time Magazine. The invention is not only in its comfortable design that enables amputees do normal everyday tasks with ease but also in its unbelievably low cost. When a comparable prosthetic is available for $10,000 in the United States, Jaipur foot costs mere $50. What makes it even more unique is that it is totally free of charge. With an open-door policy, there centers welcome anyone with a disability, without any discrimination — cutting across geographical, social, religious and gender bias. After the Jaipur Foot, the group is now working on bringing the Jaipur Hand as well. I am fundraising to provide Jaipur foot to 200 amputees. At a cost of just one dinner (Rs.3000/ $50), we can help bring back mobility, dignity, and the ability to earn livelihood for one person. Please help me achieve this target before 20th February 2015!